This is where it ends. The last part of my Easter Trip 2013. 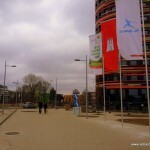 It was an amazing time and a lot of things happened since then. But now to my final trip from Brussels to Hamburg to Berlin to home.I started off after a great week in Brussels on Friday morning at 6 with an ICE to Hamburg. My mission in Hamburg: Get everything ready for the BIG Kirchentag@IGS action. For those who don’t know, „Deutscher Evangelischer Kirchentag“ (DEKT) will be held in Hamburg this year. 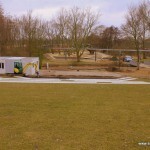 And one part of the programme is taking place on the Internationale Garten Schau (IGS), a 100 hectar big area with three big stages that I’m managing and moderating with a very cool team 😉 The area is so big that we had to cross it with bikes. 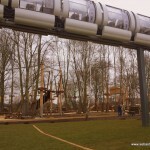 They even have a mono rail there! It’s like a little Disney Land. 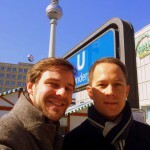 Next thing on my agenda led me to Berlin on the same day. I was there at around midnight. 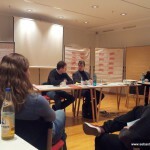 Saturday I had Jusos Germany workgroup „Youth“. We started the day by discussing the SPD manifesto for the upcoming elections with Ralf Stegner (SPD). The rest of the day we talked about the conditions of vocational trainings (Ausbildung), further education, out of school-education and university education in Germany. 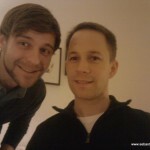 In the evening I visited my grand-cousin Thorsten. Sunday we spent eating. 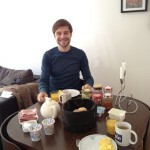 Great breakfast, nice lunch with HaMa and Marlies and waffles in a cute café. In the morning we also went to a service by Berlin Projekt in a movie theater (how cool is that!!!) 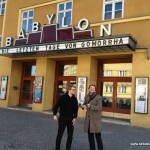 called „Kino Babylon“ near Berlin Alexanderplatz. 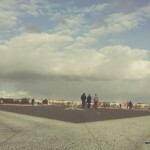 The title of the movie they were showing there was fitting very well: „Die letzten Tage von Gomorrha“ (The last days of Gomorrah) 🙂 Then we spent the afternoon on Tempelhof airport. 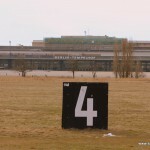 The former airport in the middle of Berlin is used as a park by the public nowadays. People skate on the airfield, fly kites or just lay in the grass. Here my long Easter trip ended and in the evening I went back home. It was an amazing time and I want to say thank you to everybody who offered me food, a place to sleep, new input, a smile, deep talks and so much more. If you have no clue about what I’m talking here, just have a look here and read Part I, Part II, Part III and Part IV of the Big Easter Trip.